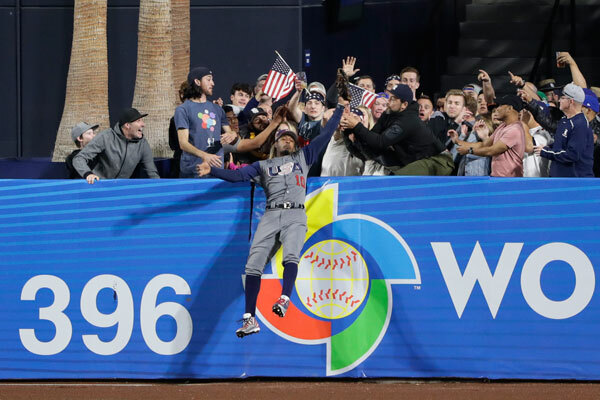 SAN DIEGO -- The United States is going to the semifinals of the World Baseball Classic for the second time thanks to another impressive home run by Giancarlo Stanton at Petco Park and a spectacular catch at the fence by hometown favorite Adam Jones. Stanton hit a go-ahead, two-run shot into the third-level balcony of the Western Metal Supply Co. Building in the left-field corner in the fourth inning and Jones robbed Baltimore Orioles teammate Manny Machado of a home run in the seventh to help the Americans beat the Dominican Republic 6-3 on Saturday night, eliminating the defending champions. 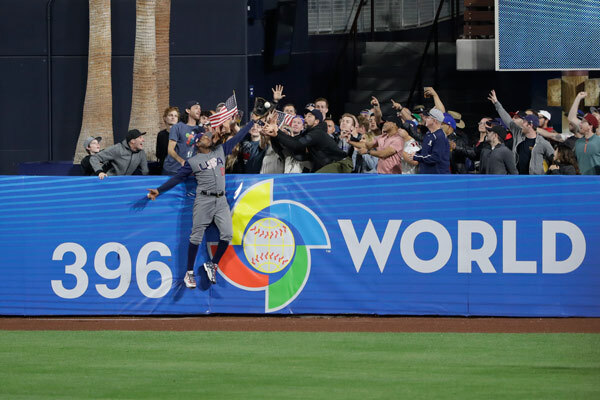 Team USA will face Japan on Tuesday night at Dodger Stadium for a spot in the championship game. A number of big-name players declined to play for the United States. Manager Jim Leyland appreciates those who did sign up. "There were a lot of people that respectfully declined and we're not going to throw anybody under the bus," Leyland said. "We're going to honor the people that accepted and are here. So we're moving forward and that's all we're talking about. ... And right now that's the only team I care about. And these players that are here are the only players I care about right now." 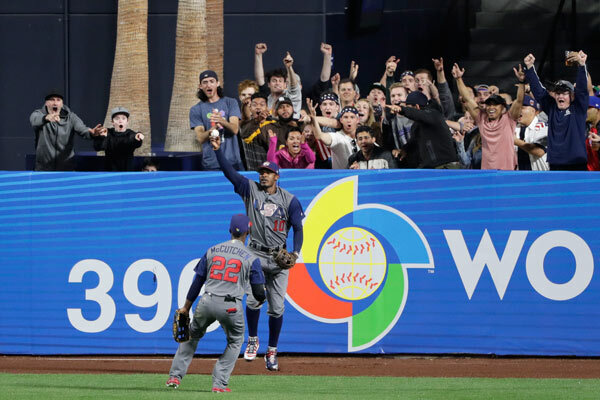 Stanton's homer gave the United States a 4-2 lead and put a charge into the sellout crowd of 43,002. The slugger's shot was reminiscent of his Home Run Derby victory at Petco Park on July 11, when he peppered the far reaches of the big downtown ballpark, including hitting one onto the top of the 108-year-old brick warehouse. "Yeah, it did kind of feel like the Home Run Derby," Stanton said. 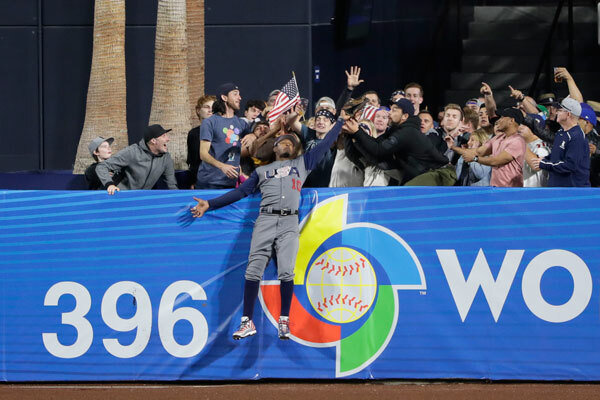 Three innings later, Jones leaped and reached over the fence in the deepest part of the park in right-center to rob Machado of a home run. Machado tipped his helmet to Jones. "I'm still in kind of shock that I even got to that ball," said Jones, who played at Morse High about 8 miles east of Petco. "I mean, off the bat I'm just like, 'This ball's hit really far, so just keep going, keep going. You know this California air's going to slow it down and just never quit.' That's just the style I play with. I don't mind running into a wall or two. I just kept going after the ball. "I saw the replay after the game. 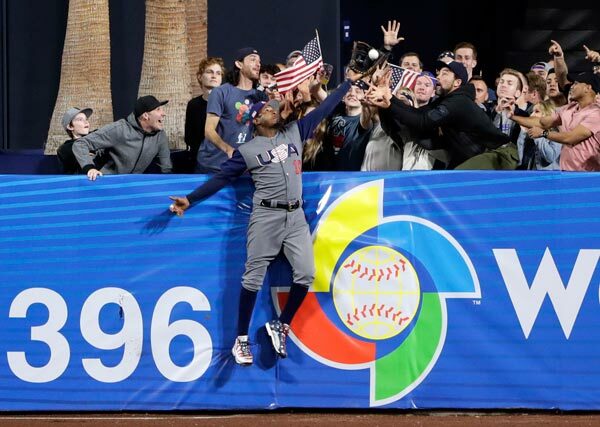 It was a hell of catch," he added. "This was a very difficult game," Dominican Republic manager Tony Pena said. "You have (eight) players on base and we couldn't do the best. I feel very proud of each one of them. I won't point to any one of them. Simply the U.S. team (made) the right pitches at that particular time frame and that's what cost us the game." Ervin Santana gave up four runs and six hits in 3 2/3 innings. He struck out two and walked none.